Superb 5 star apartment accommodation is what you will get at the Palm Cove Apartments. Situated on the Cairns Northern Beaches the Palm Cove Apartments are housed within the Mango Lagoon Resort & Wellness Spa and provide the perfect relaxing holiday retreat for couples or the entire family. The Palm Cove Apartments are close to magnificent golf courses, restaurants, bars, cafes and boutique shops within Palm Cove itself and also only 400 metres from one of Queensland's finest beaches. Set in a delightful tropical garden setting and with 4 swimming pools, including a 50 metre lap pool, the Palm Cove apartments provides the ultimate in relaxing Queenland holiday accommodation. Stay more than 5 nights and you will not only receive great discount rates but you will also receive a 15% Restaurant / Bar Discount valid throughout your entire stay. If you are after great value studio apartment accommodation in a fantastic Cairns city centre location then stay at the Northern Greenhouse Apartments Cairns. Situated only a few hundred metres from the Cairns mall the Northern Greenhouse Backpackers are ideal for the budget conscious traveller who wants fully self contained accommodation in the heart of all the action. Featuring a swimming pool, tour desk, guest laundry, Free off street security car parking and BBQ facilites the Northern Greenhouse Apartments & Backpackers Cairns are the ideal budget Queensland holiday destination. If you've chosen the Ocean Hotels Hides Hotel Cairns (formerly the Club Crocodile Hides Hotel Cairns) then you're looking for value for money accommodation right in the heart of the Cairns CBD. Numerous restaurants, cafes, nightclubs and the Cairns Esplanade are all within a couple of minutes walk from our hotel. The Ocean Hotels Hides Hotel is a heritage listed building and was restored in 1997 adding the comfort and convenience of modern accommodation rooms, while retaining the colonial charm. The wide colonial verandas that front the hotel provide a unique vantage point to view the Cairns city and offer a relaxing place to enjoy your complimentary continental breakfast. Your hotel room will be either one of the Heritage listed budget style accommodation rooms with shared facilities (only 25 available) or a motel style room complete with ensuite bathroom (80 available). The Hotel Cairns accommodation will suit the most discerning of travellers with luxuriously appointed hotel rooms set around a lagoon style swimming pool and tropical garden setting. The Hotel Cairns is ideally located within close proximity to everything that Cairns has to offer, including the city centre, nightlife entertainment and fine dining along the Esplande. With great hotel facilities including a gymnasium and luxury furnishing in the rooms, including DVD players, plump beds, air-conditioning and sizeable baths the Hotel Cairns really is the perfect relaxing retreat for you next holiday in Far North Queensland. 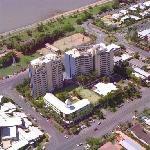 Budget Cairns accommodation in a central location is what the Great Northern Hotel Cairns offers. This property is recommended by the Lonely Planet and provides an ideal place to relax and unwind after a long day sight seeing around the Great Barrier Reef and Cairns area. The hotel rooms are clean and comfortable with split system air-conditioning and a TV with Free in-house movies, whilst the friendly staff at the 24 hour reception and tour desk will be more than happy to assist you with your holiday requirements. Located in the heart of the Cairns city centre the Great Northern Hotel is the place to stay, with discount accommodation rates available online. At the Cairns Gateway Resort you have a choice of either self-contained studio apartments and motel accommodation rooms at very affordable rates. This makes the Cairns Gateway Resort the perfect location for your next tropical family holiday in Far North Queensland. Our beautifully landscaped resort is situated on the southern approach to Cairns and is only a 7 minute drive to the city centre. Surrounding the studio style apartments is our resort's large beach style pool with its own BBQ area and small playground for the kids. Cairns Gateway Resort's numerous facilities ensure that you and your whole family will have a very relaxing and enjoyable holiday in Cairns. When you choose to stay at the Grosvenor in Cairns you will be able to choose from a range of budget studio, 1 and 2 bedroom self contained apartments. You will also be able to make use of the many guest facilities, which includes the direct internet access, faxing facilities, free car parking, guest laundry, fitness equipment, outdoor swimming pool, tour desk, bbq facilities, landscaped garden, 24 hour reception, baby cots available and daily housekeeping. From the Grosvenor in Cairns Apartments you can discover the sights and sounds of the rainforest at Cairns Wildlife Dome, get up close to koalas and snakes at Cairns Tropical Zoo or ride the iconic Skyrail and Kuranda Scenic Railway. The Aspect Central Hotel Cairns provides guests with boutique motel accommodation at great value discount rates. Ideally situated in the heart of the Cairns CBD the Aspect Central Hotel is an ideal place from which to explore the Great Barrier Reef from, as well as all of the other Cairns tourist attractions. The Aspect Central Hotel Cairns provides holiday makers and business travellers with discount hotel accommodation in Cairns, Queensland. The Cairns New Chalon Motel is ideally located within easy access of the city centre, shopping, restaurants, beaches and Cairns major tourist attractions, including wildlife parks, Great Barrier Reef and the tropical Cairns highlands. Facilities at the Best Western Motel Cairns include a restaurant and bar, room service, large resort style swimming pool with HUGE waterslide and in-pool attractions including a sea horse and whale, childrens playground, off street undercover car parking and Free AUSTAR. For great family fun on your next Queensland holiday stay at the New Chalon Motel Cairns. The Ibis Styles Cairns Hotel and Apartments is an affordable qaulity resort offering Deluxe Hotel Rooms, 1 Bedroom Loft Spa Suites and 2 Bedroom Apartment Suites which are ideal for holiday makers and business travellers. This Cairns Apartment Hotel is delightfully set on two hectares of tropical gardens in the heart of city centre and close to Queensland's world famous Great Barrier Reef. When you stay at the Coral Tree Inn in Cairns you will be able to make use of the many guest facilities, which includes the business centre, direct internet access, disabled facilities, faxing facilities, free car parking, guest laundry, restaurant, outdoor swimming pool, tour desk, bbq, massage room, garden, baby cots available and daily housekeeping. With beautiful tropical gardens, fantastic location, exceptional service and affordable rates, the Coral Tree Inn in Cairns provides the perfect accommodation for your next stay in Cairns. Quality hotel accommodation in Cairns ranging from clean and affordable hotel rooms through to spacious family suites and studio units. With the Cairns city centre close by the Cairns Queens Court Hotel will make both leisure and business travellers happy. Discount hotel rates are available for longer stays in Cairns. Rydges Esplanade Resort Cairns is located in the heart of Cairns with easy access to all of Cairn's shopping, restaurants, cafes and entertainment. Situated close to the Cairns Convention Centre business travellers will appreciate the exceptional hotel facilities at the Rydges Esplanade Resort. Also holiday makers will like staying at the Rydges Esplanade Resort Hotel because of the many recreational facilities and the ease from which they can take a day trip to the nearby Great Barrier Reef. North Cove Waterfront Suites in Cairns has numerous guests facilities for your convenience including direct internet access, faxing facilities, free car parking, lift, spa, outdoor swimming pool, tour desk, bbq facilities, landscape garden, security access, baby cots for hire and even a babysitting service. Ideal for corporate business travellers and holidaymakers alike, the North Cove Waterfront Suites offers the unsurpassed location of the Cairns Esplanade only minutes walk to central Cairns, shops and restaurants. Gilligans Backpackers Hotel and Resort is centrally located between Sheridan & Grafton streets, in the midst of Cairns city centre. Gilligan's is the ideal accommodation base from which to explore the beautiful and tropical north of Queensland including the Great Barrier Reef. Guests at the Gilligans Backpackers Hotel can laze by the pool sipping cocktails, browse over market stalls or experience total relaxation with a massage. The cheap hostel accommodation and discount hotel rooms are perfect for those people looking to have a fun holiday without spending a fortune. Cascade Gardens provides travellers with discount accommodation in Cairns, complete with a range of modern amenities such as lounge bar, direct internet access, disabled facilities, faxing facilities, free car parking, guest laundry, gym & fitness equipment, spa, outdoor swimming pool, tour desk, bbq, garden, baby cots available and daily housekeeping. Accommodation at the Cascade Gardens Cairns consists of fully refurbished Studio and 1 Bedroom Apartments with fully self contained kitchens located in the heart of the Cairns city centre. When you stay at the Citysider Holiday Apartments in Cairns you will be able to make use of the many guest facilities, which includes the child minding, free car parking, massage, outdoor swimming pool, tour desk, bbq, garden and babysitting service. The Citysider tour desk will help with all your touring needs and car hire is also available to access areas such as Port Douglas, the Atherton Tablelands and Mission Beach. With a range of budget accommodation options available including share cabins, 2 bedroom cabins and deluxe villas the Whiterock Leisure Park in Cairns truly has something for everyone. This budget holiday resort accommodation is ideal for for couples, groups & families who are looking for somewhere cheap to holiday in Cairns. The sparkling in ground swimming pool is centrally located and adjoins a large undercover BBQ area and fully self contained camp kitchen complete with with television, cooking and fridge facilities. The Bay Village Tropical Retreat Apartments in Cairns have a selection of hotel suites and fully self contained apartments available at great discount rates. This resort accommodation is ideally located in the Cairns city centre and is perfect for both holiday makers and business travellers to Cairns. The Bay Village Tropical Retreat is a family-owned retreat with 2 levels, offering personalised service and value for money. guests can sit back and soak up the relaxed informal atmosphere in the award winning gardens at the Bay Village Tropical Retreat. The Oasis Inn Holiday Apartments in Cairns provices budget motel, studio, 1 & 2 bedroom self contained apartment accommodation for holiday & busienss guests close Cairns Esplanade and the Great Barrier Reef. Oasis Inn Cairns provides holiday accommodation right in the heart of Cairns and is an ideal place for family holiday, singles or couples vacationing in the tropical north of Australia. Accommodation at the Mid City Luxury Suites is in 1 bedroom self contained serviced apartments that are complete with all of the amenities to make you feel right at home. The Mid City Suites in Cairns is centrally located close to everything that the city has to offer and provides elegant holiday accommodation for all sorts of travellers. For guests who choose to stay at the Reef Gateway Apartments in Cairns they will not only get great value for money self contained accommodation but will also be just a short walk from all that the city centre has to offer. They can also make use of the many guest facilities at this property, which includes the faxing facilities, free car parking, spa, outdoor swimming pool, tour desk, bbq area, tropial gardens and baby cots. The Reef Gateway Apartments Cairns is owned and run by a very knowledgeable couple, offering you that extra local knowledge and personal service to make your holiday as enjoyable as possible. Cairns Colonial Club Resort provides travellers with discount accommodation in Cairns, complete with a range of modern amenities such as lounge bar, business centre, conference centre, internet access, disabled facilities, faxing facilities, free car parking, guest laundry, gym, massage, restaurant, room service, sauna, spa, tennis court, tour desk, bbq, massage room, airport shuttle, security, 24 hour reception, babysitting service and daily housekeeping. With 5 hectares of tropical gardens, 3 lagoon swimming pools and 2 resort restaurants the Cairns Colonial Club Resort provides a home away from home whilst you are in Cairns, combining the tranquility of a tropical resort with the advantages of a mainstream hotel. 201 Lake Street provides travellers with discount apartments in Cairns, complete with a range of modern amenities such as direct internet access, free car parking, lift, outdoor swimming pool, tour desk, bbq and baby cots available. Ideally located in the central business district of Cairns, just off the Esplanade and only a short stroll from the main Cairns shopping precinct, 201 Lake Street is a dream destination ideal for tourists, holiday makers and corporate business travellers alike. Best Western Plus Cairns Central Apartments provides travellers with discount accommodation in tropical North Queensland, complete with a range of modern amenities such as conference centre, direct internet access, faxing facilities, free car parking, guest laundry, lift, massage, restaurant, spa, outdoor swimming pool, tour desk and baby cots available. The Best Western Plus Cairns Central Apartments Hotel offers friendly customer service, a central Cairns location and affordable accommodation that is perfect for the corporate and leisure travellers. Tradewinds McLeod Holiday Apartments provides travellers with discount accommodation in Cairns, complete with a range of modern amenities such as business centre, direct internet access, faxing facilities, free car parking, outdoor swimming pool, tour desk, bbq, garden, security and baby cots available. The affordable rates and quiet yet convenient location affords relaxation and accessibility, making the Tradewinds McLeod Holiday Apartments a delight for families visiting Cairns and tropical Far North Queensland. The Cairns Southside International Inn is Cairns newest 4 star flag choice quality inn offering affordable motel style accommodation rooms. The Cairns Southside International Motel is situated only 3kms from city centre and within easy walking distance to a major shopping centre, clubs and gymnasium. The hotel features of the Cairns Southside Inn include a restaurant with room service, swimming pool with a crocodile slide for the kids, spa, BBQ area, guest laundry and free in house video's and cable tv. The Cairns Southside International Motel acts as the ideal gateway to the spectacular Great Barrier Reef, the world heritage rainforest areas of North Queensland, the popular beaches of Port Douglas or the serenity of the Atherton Tableland area. The Nomads Cairns Backpackers Hostel provides travellers with discount accommodation in Cairns which is ideal for the budget conscious. It comes complete with a range of modern amenities such as lounge bar, direct internet access, free car parking, guest laundry, restaurant, outdoor swimming pool, tour desk, bbq and airport shuttle. Nomads Cairns is a purpose built resort hostel, located only minutes away from the Cairns Esplanade, gateway to the Great Barrier Reef, including everything you need to enjoy Tropical North Queensland in style. Situated within easy walking distance of the beautiful palm-fringed Trinity Beach and the local shopping centre is the Prime Trinity Beach Pacific Apartments. The tropical swimming pool with refreshing waterfall, poolside BBQ area, free access to the local gymnasium and breakfast patios or balconies on every room make these Trinity Beach apartments the perfect place for a relaxing and enjoyable Queensland holiday. The superb central location of our apartments makes them ideal for couples and families who want to get away and enjoy the nearby attractions, including the Great Barrier Reef, Kuranda Skyrail, Atherton Tablelands, Cape Tribulation and the Daintree Rainforest. Surrounded by lush landscaped gardens the Palm Royale Hotel Cairns is a boutique, resort style property with a difference, Mediterranean at heart with a tropical ambience. The Palm Royale Cairns provides travellers with discount accommodation in Cairns, complete with a range of modern amenities such as lounge bar, direct internet access, free car parking, guest laundry, lift, restaurant, spa, outdoor swimming pool, tour desk, bbq, airport shuttle, 24 hour reception and daily housekeeping. If you are looking for luxury hotel accommodation in Cairns then stay at Pullman Cairns International. With luxuriously appointed hotel rooms and suites located in the heart of the Cairns city centre The Pullman Hotel is perfect for the discerning holiday or business traveller to Queensland's tropical north. For budget hotel accommodation in Cairns stay at the Heritage Cairns Hotel. Conveniently positioned in the heart of the Cairns CBD the discount rates make it the ideal destination for the budget conscious traveller. With so much to see and do in and around Cairns the Heritage Cairns Hotel is sure to ensure that you next stay is both memorable and fun. The Nomads Esplanade Backpackers Hostel provides travellers with discount accommodation in Cairns, complete with a range of modern amenities such as direct internet access, guest laundry, outdoor swimming pool, tour desk, airport shuttle, security and 24 hour reception. This really is the closest hostel to the Great Barrier Reef, so why not stay in the centre of Cairns at Esplanade Backpackers Hostel. Idelaly located directly opposite Cairns Lagoon, and just a short boat ride to the Great Barrier Reef. This backpackers hostel is designed for travellers who want to relax & have fun without breaking the budget. The Cairns Sheridan Hotel is a hotel motel providing luxury holiday & corporate accommodation close to the Great Barrier Reef and Daintree Rainforest. For the very best Cairns accommodation, the Cairns Sheridan Hotel is an affordable boutique hotel offering value for money accommodation with exceptional facilities. The Cairns Sheridan Hotel has discount rates available for longer stays in Cairns, Queensland. The Getaway On Grafton provides travellers with discount apartments in Cairns, complete with a range of modern amenities such as direct internet access, faxing facilities, free car parking, spa, outdoor swimming pool, tour desk, bbq and baby cots available. Getaway on Grafton Apartments Cairns offers clean, comfortable and fully furnished rooms where you can relax and enjoy the tropical lifestyle that Cairns has to offer. The Half Moon Bay Resort Holiday Apartments are located at Yorkeys Knob on the Cairns beaches, directly opposite the Half Moon Bay Golf Course. Only a short walk away are the beautiful sandy beach and a variety of restaurants and shops. It is also only a ten minute drive to Cairns International Airport and 15kms to the Cairns city centre. When you stay at the Half Moon Bay Holiday Apartments you can dive and snorkel the Great Barrier Reef, tour around the Daintree and Cape Tribulation rainforests or travel on the scenic Skyrail and Kuranda Train. For a relaxing tropical holiday in Far North Queensland the Half Moon Bay Resort Holiday Apartments offer a very affordable choice. The Rydges Plaza Hotel Cairns is the most centrally located hotel in the whole of Cairns. Our luxury hotel is situated within easy walking distance to the Cairns Convention Centre, Reef Casino, Great Barrier Reef departure terminals, Esplanade lagoon, foreshore promenade, numerous restaurants and the Cairns central shopping complex. The Mangrove Jack's Restaurant is located on the 3rd floor of the Rydges Plaza Hotel and it's creative menu features delicious seafoods and tender steaks. The Rydges Hotel also features the Crown Lager Bar, and it's relaxed atmosphere provides the perfect meeting place for a refreshing drink or cocktail. Whilst you are staying in Rydges luxurious accommodation why not partake in some of Cairns relaxing pastimes including golf on one of Cairns beautiful golf courses, a ½ or full day fishing tour, tours of hartley's crocodile farm and Cairns Zoo or tours of the Great Barrier Reef including snorkling. Luxury Cairns hotel accommodation in an ideal central location. Shangri-La Hotel Cairns is located in the historic Marlin Marina of Cairns. Providing luxury hotel accommodation in a wide range of hotel rooms and suites the Shangri la Hotel is on the Cairns waterfront above the Pier Shopping Complex and Dining Promenade. The Shangri la Marina Hotel provides holiday makers and business travellers with the perfect luxury hotel accommodation in Cairns, Queensland. The Bohemia Resort in the heart of Cairns offers price busting backpackers hostel accommodation as well as hotel rooms and 3 bedroom self contained apartments. This range of quality accommodation options makes the Bohemia Resort Cairns ideal for singles, leisure guests, families, business travellers, groups and sporting trips. Budget Cairns accommodation is what the Comfort Inn Cannon Park Hotel is known for. This Cairns hotel is within walking distance to shops and restaurants and the Cannon Park Race Course is also located opposite the motel. The picturesque Cairns Foreshore is an easy 15-minute drive away and the Comfort Inn Cannon Park Hotel Cairns has a tour desk that can help you organize day trips to the Great Barrier Reef Marine Park. If you are looking for a resort that embodies the true hospitality of Tropical North Queensland then the Cairns Rainbow Resort is the property for you. With our large swimming pool surrounded by lush tropical gardens and coconut trees and location close to the CBD, shopping, restaurants, cinemas, conference centre and the Cairns airport the Cairns Rainbow Resort provides the perfect holiday accommodation. Alternatively you can wine and dine at the Rainbow Inn's very own Coral Gardens Restaurant and Cocktail bar, which offers a large range of a-la-carte dining and beverages, and is open until late. The tour desk at the Cairns Rainbow Resort can advise on numerous popular tours in the Cairns region including the Great Barrier Reef, Daintree Rainforest and Historic Kuranda Train. The Oasis at Palm Cove Apartments are set amoungst a 2 ½ acre tropical garden and are only a 2 minute walk from the spectacular beach and a 5 minute from a choice of 22 award winning restaurants. The magnificent location makes the Oasis at Palm Cove perfect for either couples wanting a romantic getaway, or families looking for a relaxing and fun-filled Queensland holiday. 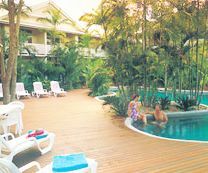 The facilities of this Palm Cove resort include a large spa pool, swimming pool, full size tennis court and much more. The Oasis at Palm Cove Apartments are located only 20 minutes north of Cairns Airport and offer luxury self-catering accommodation in a secluded tropical Queensland location. Oasis Palm Cove is close to the major tourist attractions including the Great Barrier Reef, the Skyrail rainforest cableway and the championship golf courses at the Paradise Palms and Novotel Resort. Click here for more Palm Cove Holiday Apartments. Rydges Tradewinds Cairns is located in the heart of Cairns with easy access to all of Cairns' shopping, restaurants, cafes and entertainment. Being positioned close to the Cairns Convention Centre makes the Rydges Tradewinds Hotel ideal for business trips and being a gateway to the Great Barrier Reef makes the Rydges Tradewinds Cairns perfect for holiday makers. Calypso Inn Backpackers Resort in Cairns is a budget hostel that features shared dorm & private hostel accommodation with large discounts available for those holiday makers who only need their room to rest their heads. The Calypso Inn Back Packers has superb facilities including a tropical gardens with a relaxed atmosphere, swimming pool, Zanzibar Bar & Grill, security, internet access, air-conditioning and friendly tour desk. Comfort Inn City Sheridan Motel Cairns is a 3 ½ star boutique style motel centrally located close to the CBD, casino, major shopping centre, restaurants, nightclubs, cinemas, convention centre and the Cairns airport. Our motel accommdation rooms are very spacious and feature an ensuite bathroom, mini bar, balcony with either a pool or street view, air-conditioning and in-house movies. The Comfort Inn City Sheridan Motel also includes Julians a-la-carte restaurant and cocktail bar, a swimming pool, BBQ area and free guest car parking. The friendly staff at the City Sheridan Motel will be more than happy to help you to plan your day trips to the Atherton Tablelands and Cairns beaches, or advise on the best tours to the Great Barrier Reef, Daintree Rainforest and Historic Kuranda Train and Skyrail. 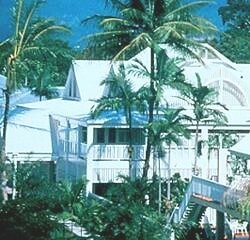 The Port Douglas Retreat Holiday Apartments is your retreat to tropical North Queensland paradise. This holiday accommodation in centrally located in Port Douglas, Australia is just a 5 minute walk to the beautiful palm fringed 4 Mile Beach, the fabulous Marina Mirage and the Port Douglas village centre with its street side cafes, first class restaurants, boutique shops and art galleries. On your relaxing Queensland holiday you can play a game of golf or tennis, scuba dive, sail or snorkel amongst the abundance of colourful marine life of the Great Barrier Reef or alternatively 4 wheel drive, bushwalk or safari through the pristine World Heritage Rainforest of the Daintree and Cape Tribulation. The facilities at the Port Douglas Retreat include a large saltwater pool, barbeques with gazebo, undercover security car parking, guest laundry facilities, tour & information desk and free in-house movies. 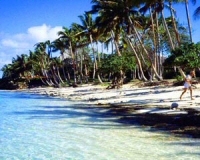 Click here for more Port Douglas Holiday Apartments.